Beverly Beckham, at age 11, wearing her favorite dress. “It was pink, not too pale and not too bright,” she writes. I have a picture of me, at age 11, in my favorite dress. It was pink, not too pale and not too bright, and it was A-lined and buttoned up the front. I wore a crinoline under it, so the dress swooshed when I walked. In the picture, you can see my white ankle socks, but not my shiny black patent-leather shoes. It was spring. I was in sixth grade at Tower Hill School in Randolph. In seventh grade, I was sent to a Catholic school where I was made to wear a uniform every day. Navy blue? Logan green? I forget. It was a jumper, and the material was coarse and thick and even though I ironed it inside out, it still shined. It was the ugliest thing. High school was more of the same. Another uniform. A pleated plaid skirt, white blouse, and navy blazer every school day for four years. By the time I graduated, I was used to sameness. Able to wear anything I wanted, I chose what I was used to: dark skirts, dark pants, dark colors. That’s what I still choose today. Except in spring. For a few weeks, I morph into a person I don’t know. This person reads fashion magazines. This person gazes with envy at pictures of women who are dressed in pastels and festooned with flowers, whose wrists are gilded with bracelets, whose shoes are as high as stilts, and who wear dangly earrings and bright red lipstick, even to Shaw’s. And this person, who is and isn’t me, who, like a hyacinth, is dormant and underground most of the year, big and gaudy only for her short bloom, does exactly what she promises. She buys, not all of these things, but some of them, clothes and accessories that are bold and bright and beautiful, but that I never wear. The spring I was 19, my doppelgänger insisted I buy a bright pink double-breasted “The Umbrellas of Cherbourg” coat. I had decided on a black one. “No! No! No!” the saleslady cried. “No! No! No!” my doppelgänger echoed. I wore that pink coat until it wore out. 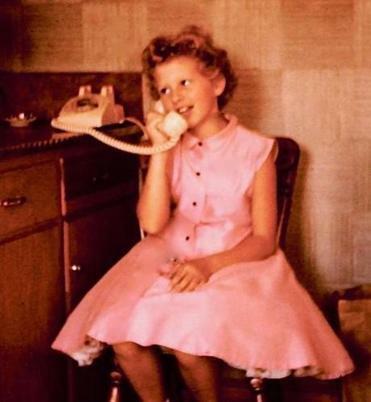 I loved it the way I’d loved my pink dress a decade before. She was pleased with me that year. And it was. But come summer, after she went back underground, I put on the floral skirt and silky blouse and matching sandals and looked at myself in the mirror and saw not a Monet, but a sloppy painter’s dropcloth. It’s been like this since. My spring self emerges, looks in my closet, shakes her head, drags me shopping and under her spell, I buy big hats, costume jewelry, shoes that dare me to walk in them, and pretty skirts that beg to be twirled. Under her spell, I bought a pair of red capri pants a few years ago. “A lady never wears red,” the nuns used to say. For two summers those red pants hung in my closet. And then? Last year, bewitched again, I found a top to match, a bright red, white, blue, yellow, and white concentric patterned drapey thing. I bought it and wore it with the red pants and chunky jewelry. And someone took a picture. And back to black I went. I read. Guilty. Guilty. Guilty. What I need to do is return, right this minute, the big, bold, opposite of black jumpsuit (I know. I know. A jumpsuit? I’m too old for a jumpsuit!) that she made me buy.